Catch Jelynn at NBA All Star Weekend, Tomorrow at Nike Live Trifecta! Jelynn is currently in LA helping Nike cover this year's NBA All Star Weekend. You can watch her with pro basketball's biggest stars such as Kobe Bryant, LeBron James, Blake Griffin, Amar'e Stoudemire, and many more tomorrow at the Nike Live Trifecta. All you need to do is log into Facebook and Like the Nike Basketball page. 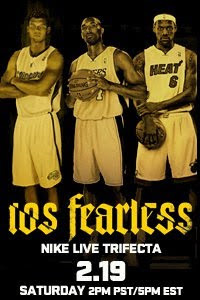 Then head over to the Nike Live Trifecta event page and watch the live stream from Los Angeles! The live event is on Saturday from 2pm-5pm PST, so don't forget and tell your friends! CLICK HERE to find the live stream on Facebook!